Early bloomer. 5 small rounded petals, leaves clustered at base of stems. 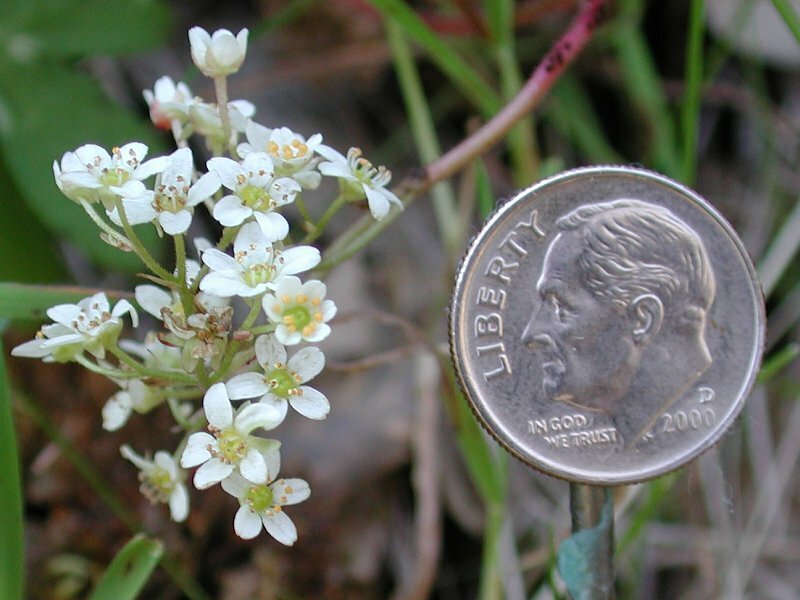 The flowers are very tiny, as seen by comparison to a dime in the photo below. Often found sprouting from between rocks. Name means rock breaker. Notes: Saxifrage family. Characterized by broad, basal leaves and slender, hairy, leafless stems. Tiny white hairs on the leaves. This species has pure white flowers. It can be showy even as early as February. This genus has about 400 species worldwide. The USDA (follow link below) lists 67 Species and 105 accepted taxa overall. Saxifraga means stone-breaker in reference to the rocky habitats of some species and probably to the use of some species in dissolving gallstones.